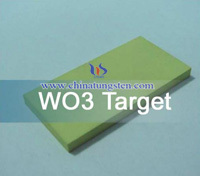 Tungsten trioxide target is often used as the evaporation material of WO3 thin film. Producing process of tungsten trioxide target adopting electric ceramic, process is ball milling, compression moulding and calcination. During the producing process, quality of raw material has determined effect on property of ceramic. Differences between functional ceramic and traditional ceramic are embodied in the control of raw material, grain size and distribution, reacting activity, crystalline and cost. The common tungsten trioxide target producing methods are solid phase method, vapor phase method and liquid phase method. 1.Solid phase method preparing tungsten trioxide target: Calcinating APT with oxidation reduction several times. Grain size will decrease after every step of oxidation or reduction. 2.Vapor phase method usually uses volatile compounds as raw material. 3.Liquid phase method producing tungsten trioxide target can add high concentrate hydrochloric acid into sodium tungstate solution, tungstic acid precipitation is obtained, after dry and calcination, then forms into tungsten trioxide target material. 1.Preparing tungsten trioxide with high purity, high sintering activity and fine pressing property.